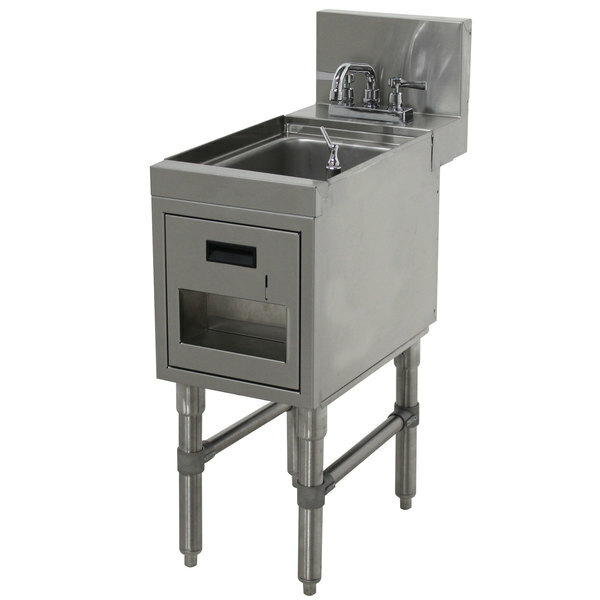 Deep drawn sink bowl measures 10" x 14" x 10"
Boost the sanitation efforts of your foodservice operation with the versatile Advance Tabco PRHSST-25-18 Prestige series stainless steel underbar hand sink with soap and towel dispenser. Items found within the Prestige series of underbar equipment line up perfectly with each other, creating a uniform look across any bar. In addition to a number of eye-catching features, this item boasts an exclusive twist-action leg assembly for added strength and an extended backsplash to create a truly one-of-a-kind unit. This free-standing unit features a one-piece deep drawn sink bowl that measures 10" x 14" x 10", as well as a built-in deck mount soap dispenser and c-fold towel dispenser. By keeping all the essential pieces in one place, your wait staff can enjoy extended convenience and increased efficiency. In addition, a 7" backsplash prevents water from spilling onto the floor and walls immediately around the unit. A 1 1/2" IPS drain is fitted to the basin for quick and efficient draining, and a 3 1/2" basket is included. For added convenience, a rear deck allows for even for space and storage. The 4" K-51 deck mount faucet meets federal lead free standards, making this Advance Tabco PRHSST-25-18 Prestige hand sink the perfect addition to any commercial setting.